I was so worried about the logistics of this assignment after last year’s disastrous summer. I even discussed with the tutor what to do should it be impossible to find any flowering plants. Last year, just about nothing flowered until September, too late for this assignment. This year, we had the opposite problem, it was so hot that many things grew and flowered quickly and went to seed just as quickly. I chose a marsh not too far away for this assignment, as part of the assignment was to be visiting almost daily to record the different plants at the site. 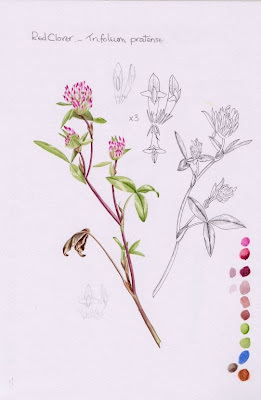 I didn’t realise, though, that I was supposed to be drawing and painting every plant at the site, to send in with the finished painting! Good job I reread the brief about half-way through the two months or I’d have had even more work to do in the final two weeks. Throughout June and half of July, I’m afraid I paid more attention to my oldest dog who was unwell, than to the assignment. Unfortunately, despite our best care and the care of the vet, we sadly had to make the heartbreaking decision to say goodbye. I have to admit, I more or less was sleepwalking for the rest of the assignment, apart from when the Horseflies found me in the marsh and decided I was delicious. Trying to accurately measure, draw and paint plants while fighting off these sneaky little biters was no fun. Forget the beasties and bugs of the Amazon, these little blighters were out for BLOOD and even managed to cut me through my blouse! I spent many a day trying to outrun them, whilst trying also to get some work done. In the end, I’m afraid I took samples of the more common plants and brought them home, although the marsh orchids stayed put, apart from three small flowers collected from the head of one particularly floriferous Orchid. 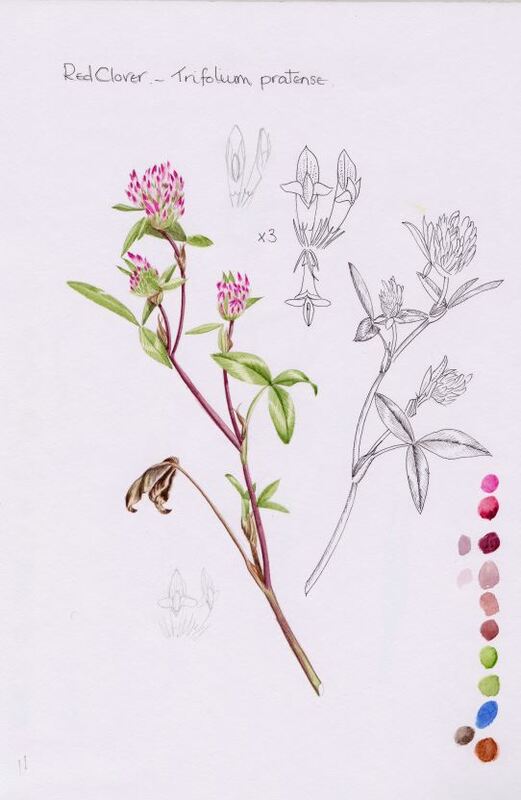 Two weeks doesn’t seem very long to accurately identify and record all those plants, draw up dissections, and then produce a painting of Five of them. But it’s long enough. I was even almost pleased with the painting when I sent it off, with photocopies of the fieldwork sketches, to my tutor in time for the deadline. And luckily he seemed to enjoy my work, giving me my highest mark yet! Well done on a challenging assignment, and even despite the extra stress of losing a beloved pet! I think your clover leaves are marvelous. Sorry to hear about your dog, but it sounds like you lavished care on her. She must have felt loved. Thanks Janine, we loved her so much! But despite everytthing we did, and the vets, it was not fair to keep going. I've been studying clover leaves for years, so they almost painted themselves. I'm in awe of your brambles, they are superb!